The Brothers’ mission in the Philippines began in 1911, when the first group of foreign Brothers arrived in Manila. At first, people thought that the Brothers were like the Spanish friars of the conventos since they were men of God who taught the youth the basics of the Christian faith. But as people worked with the Brothers, they began to understand that the Brothers were not priests, but full-time religious educators who were inspired by the example of their founder, St. John Baptist de La Salle and have consecrated their lives for the service of youth. If the Brothers then had been involved with priestly functions, the Brothers would not be able to totally dedicate their time to the young. This is why, to this day, the Brothers remained lay religious completely devoted to the ministry of the religious education of youth. 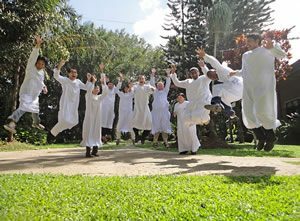 Although the Brother does not officiate in the Sacraments, it is the life of the young people that the Brother seeks to transform. Through the school, the Brother encourages the young Christian to develop his talents and abilities. Through the school, the Brother helps the young person acquire a zest for learning and living. Many students realized that the time to carve one’s own identity had come. It was then necessary for the foreign Brothers to train Filipino Brothers to take charge of the schools. With the growth of Filipino vocations, a formation program uniquely Filipino and Lasallian evolved. The total formation of the young brother in areas like work, personal reflection, and prayer. Studies in theology and pedagogy enables him to discern the call of God in his life. This leads him to make an initial commitment to a life of consecration, community and mission. After his initial formation, the young Brother is sent to a community where with other Brothers, he fulfills the ministry of educating the youth. For a number of Brothers, working in the schools is not enough. There emerged a movement to explore the so-called non-traditional apostolates. Wanting to be of direct service to the poor, the Brothers began by immersing themselves with the poorest rural / urban communities such as living with sugar workers, assisting lepers in a colony, attending to children in a street children center, and facilitating livelihood projects. Because the Brothers have diverse apostolates, one would think that the Brothers live apart from each other. But the Brother is not like a priest. As a religious, the Brother has a vow of association in a community where he lives with his fellow Brothers. The Brother makes the community his home where they could enjoy the companionship of his Brothers. For the Brothers, making such school communities accessible to all has been a constant concern. Whenever possible, the Brothers encourage their colleagues to initiate projects especially for the poor in their area. Although the Brothers are able to support many scholars, the Brothers realize that there are still many more places the Brothers can be of service. For the hopes of youth are close to God’s heart and for every young mind filled with dreams, God invites a young man to listen to the youth and dedicate his life to make those dreams come true. Whether teaching in an established school or volunteering in a non-traditional apostolate, the Brother works to influence the young and hopes that together they will both create a better world filled with the love of Christ and the reign of justice and peace.